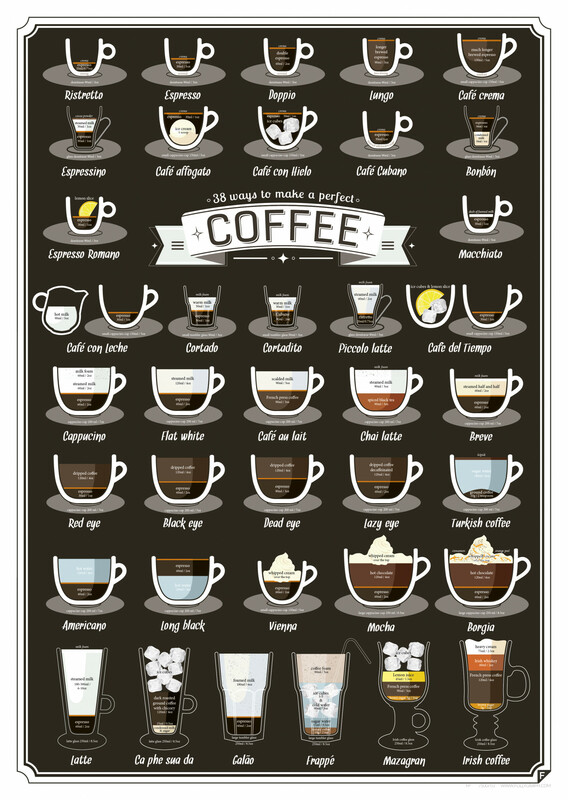 Since today is apparently the day of a zillion coffee-related news items, here’s one more for you: A lovely little infographic from design studio Follygraph instructing us on a whopping 38 ways to make the perfect cup of coffee. Most of us probably take our coffee the same way day in and day out — we are, after all, creatures of habit — but nine times out of 10, it’s worth mixing things up a bit. And these beverages? Let’s just say that they’re downright luxurious, and I would like to drink all of them. Now. At the same time. OK, so maybe I won’t actually drink them all at the same time; as we learned earlier today, that would be both an excellent way to fatally overdose on caffeine, as well as physically impossible, since there’s no way my stomach would be able to hold all of that liquid at once. But still — maybe I should make it a point to try each of them at least once by the end of 2014. I don’t know why, for example, it has never occurred to me to pour espresso over a scoop of vanilla ice cream before, café affogato-style; it sounds like the best idea ever, though, so of course I’ll have to get on that ASAP. Because . . . Yes, Watson. Yes, it is. To be honest, I didn’t even know there was a name for some of these drinks. I mean, I’ve been aware of, say, the Red Eye for a while; I did not, however, know there was such a thing as a Black Eye, a Dead Eye, or a Lazy Eye (the last of which sounds mildly offensive to me. Anyone else?). Nor was I aware that shoving a slice of lemon into your espresso makes it an espresso romano. And as for the “bonbon?” Let’s just say the only time I’ve encountered condensed milk in coffee before was in the Thai iced coffee I used to get from the place down the street from my old apartment. Man, do I miss it. Anyhoo, for the curious, here’s your guide to 38 glorious-sounding coffee drinks. Have fun, my fellow coffee lovers!